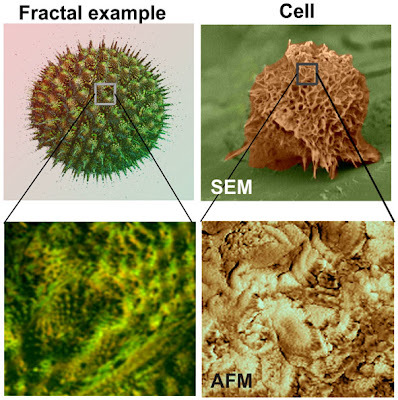 “When a normal cell becomes cancerous, the surface of it becomes fractal,” Sokolov said. In nature, complete chaotic behavior often results in fractal patterns. Fractals are self-similar patterns. If you zoom in or zoom out over something fractal, you will always find the same structure. In nature, fractals are seen in snowflakes, trees, the shapes of coastlines and even the large-scale structure of the universe. Some biological tissues have previously been known to have fractal characteristics when they have diseases. Because there is chaotic behavior inside cancer cells, it was expected that cancer cells should be fractal as well. To test the theory, Sokolov and Clarkson Univ. colleagues Maxim E. Dokukin, Nataliia V. Guz, Ravi. M. Gaikwad and biology professor Craig D. Woodworth looked at 12 tissue samples from six healthy and six cancerous patients, analyzing more than 300 cells. To examine them, the cells are first prepared for imaging in a process calling “fixation” which takes a few hours. Then, the cells are imaged over about a half hour. To do this, the researchers use a special microscope – called an atomic force microscope - that touches individual cells like a finger, examining the cell’s surface to see whether it is smooth and flat or rough, like a sponge. Computer software designed to detect fractals then processes images of the cell surfaces, working almost instantly. Above a certain threshold of sponginess, the cells are deemed cancerous. The results showed differentiation between the two cell types with 100 percent accuracy. Among the 300-400 samples, there wasn’t a single overlap between healthy and cancerous cells. Sokolov expects that the whole process could be whittled down to about five minutes. “It’s unusual because we used just purely physical methods to define what is cancerous and what is not,” Sokolov said of their work. Hunting for cancer by eyeballing cells is not new to the world of cervical cancer detection. Currently, to tell whether or not a woman has cervical cancer or is precancerous, doctors use cell pathology tests. A doctor will smear a tissue sample on a slide and examine it under a microscope. If he or she sees unusually small cells with large nuclei, it’s indicative of a possible tumor. Computer software helps doctors to verify their visual assessments. The technique, however, is not without its problems, Sokolov said. “Normal cells change shape due to irritation and inflammation and look like cancerous cells under an optical microscope. That’s where doctors are confused,” Sokolov said. If suspicious cells are observed, a patient might be sent for a biopsy. “Out of all patients sent for biopsy,” Sokolov said, “Less than one percent have cancer. Ninety-nine times the biopsy shouldn’t have been taken…Our method works at the level where doctors are confused,” preventing the need for unnecessary, expensive and psychologically challenging biopsies. Roland Sedivy, of the Department of Pathology at the Hospital Centre St. Polten and the Centre of General and Oral Pathology at Danube Private University in Austria, had the idea that cancer cells might exhibit fractals back in 1997. That year, he and a colleague published a paper detailing an idea that came to him one night after he read a Scientific American article. “I dreamt it,” he said. “About 15 years ago, there were some articles of fractals in the human body – the brain and so on – and I read it with passion. [One] night I dreamt of the fractal state of cancer cells and I thought, ‘Maybe it’s true,’” Sedivy said. Detecting cancer through fractals, and having a quantitative computer analysis to back up their qualitative microscope exam, could help doctors like Sedivy to be more secure in their diagnoses. Going forward, Sokolov and his team plan on doing broader research on more cells. Right now, the researchers are only sure of their technique on cells from cancerous and precancerous tumors. They haven’t yet tried it solely on precancerous cells. Because doctors are already capable of detecting cancer cells with success, research exclusively on precancerous cells is the next step. The team will repeat their tests with lab-grown cancer cells and see how the cells change through each stage of cancer development. The key to curing cancer, Sokolov said, is finding it in the early stages and the researchers hope their method will be effective then. Its research like this that will go significantly towards earlier detection, and eventually the cure of cervical cancer.